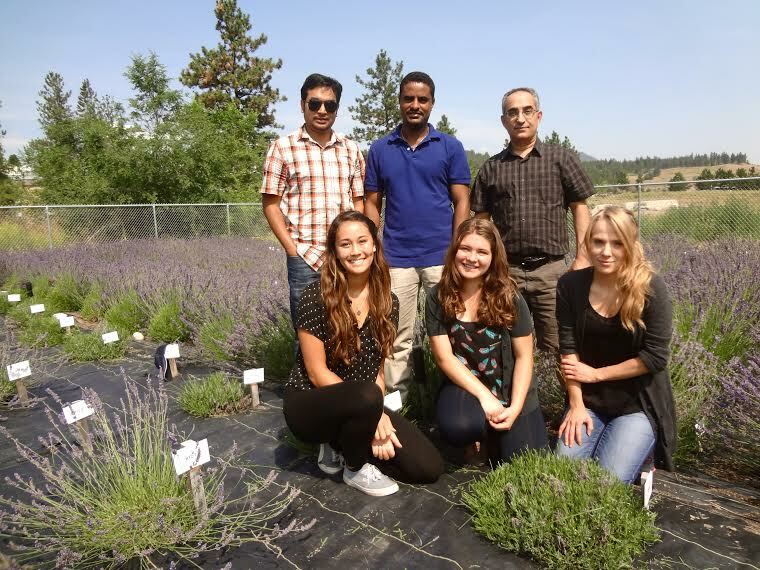 Top left to right: Lukman Sarker (PhD candidate), Ayelign Mengesha (PhD student), Soheil S. Mahmoud (PhD, Associate Professor UBC Okanagan). Bottom left to right: Felisha Truong (BSc), Ashley Lemkey (BSc), Rebecca Wells (BSc). Lavenders are a diverse group of species in the mint family with over 40 different species and many more cultivars within these species. Three varieties are primarily grown commercially: English lavender, Spike lavender and Lavandin. Each has its own particular essential oil composition making different species and cultivars better suited to particular uses. For example English lavenders are most often used for culinary purposes and aromatherapy while both English lavender and lavandin are used in fragrance and perfumery. Due to their camphoraceous nature Spike lavender oils are generally considered to be of primarily medicinal value. Lavenders have been used historically since Greek and Roman times. The name "Lavender" is derived from the latin word lavare, meaning "to wash as it was commonly added to wash water. Since this time ancients and contemporaries alike have recognized the value of lavenders and their essential oils. Using both in different preparations for the treatment of diverse ailments for its many properties including antimicrobial, anti-inflammatory, analgesic, sedative, anti-depressant and anxiolytic. Recently, the antidepressant and anxiolytic properties of lavenders have been confirmed through clinical trials confirming what many people have known for years! We encourage you to visit the sites of our contributing researchers for more information and research.